Annually, Blue Ridge Knives, Inc. produces a full line color catalog featuring our complete offering of products from all manufacturers. This catalog is priced at retail, so you may use it as a sales aid. A separate wholesale price list is shipped with the catalog. A plain cover version of our annual catalog is also available. 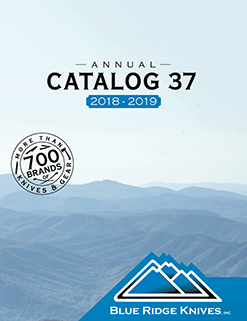 This is a wonderful sales aid since it has no reference to Blue Ridge Knives, Inc. You can show this catalog to your customers and let them browse “your” entire inventory. The monthly catalog has wholesale pricing only.